If you have taken a few swim lessons or you have been around swimming for a while, you have probably heard the term "feeling for water". Many swimmers and instructors put emphasis on gaining feeling for water, but when it comes to explaining what it is and how it feels, many hit a brick wall as it is quite hard to explain. I’ve seen swimmers who just started on their swimming journey and it is already apparent they know how to grab the water since there is a visible acceleration during their arm pull. On the other hand, I’ve also seen swimmers who have been around the swimming pool for many years and they still seem to struggle with getting a good purchase on the water. Why do you think that is? Such differences make me believe that some people are genetically better equipped to feel the water flowing over and around their bodies. That said however, as it is with everything in life, new skills can be taught and acquired if the student is willing and the teacher is able to explain and show it in an intuitive way. So, even though you might struggle with grasping the feeling for water concept and feel sometimes like you swim with pieces of wood attached to your hands, there is still hope :). Let me introduce you to "The Antipaddle". What is the Antipaddle and what does it do for you? The Antipaddle is a clever product. Most of you are already familiar with the regular swim paddles which are used to increase the surface area of your hand and thus increasing your grip on water and engaging more muscles to swim. The Antipaddle is used exactly like a regular paddle with the difference in the way it slices through the water. The Antipaddle decreases the propulsion surface area of your hand which makes it feel like your arms are just slipping through the water. Now why would you want to mimic the feeling of your hand slipping through the water? The answer is simple, by lessening the pressure of the water on your hand, you are forced to search for a better positioning of your hand and forearm in the water, so you don’t feel that your hands slip through water as much. 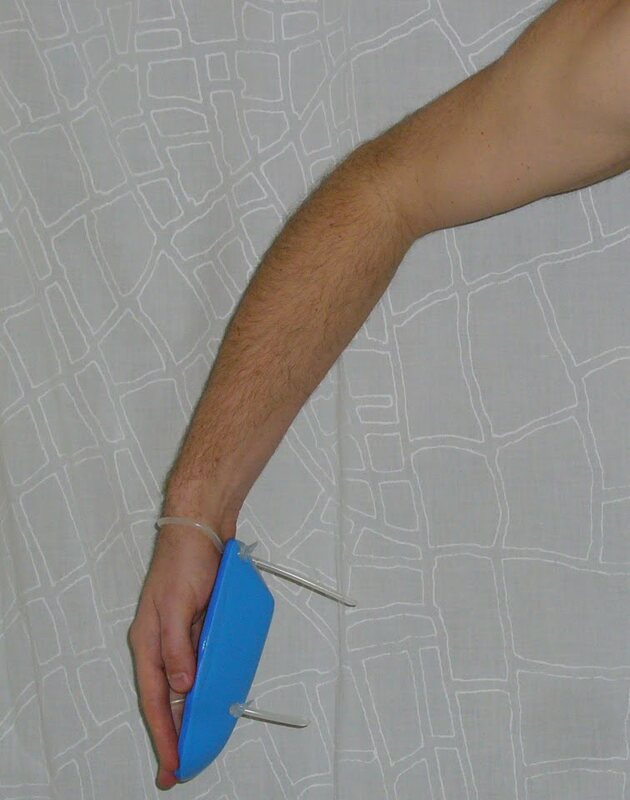 This in turn makes you catch more water and also makes your hand much more sensitive, therefore, it easier to grab onto the water after you take the Antipaddles off. At the same time, since you are finding the optimal position for your hand and forearm to achieve the infamous early vertical forearm catch, you are also gradually strengthening your shoulder and lat muscles. In other words, with antipaddles on, you desensitise your hand and then when you take them of, you feel the water much better. It is true there are other drills which serve a similar purpose and have been in use for many years. The most popular is closed fist drill, where you swim with your fists closed and try to find the optimal catch. There are even special rubber gloves for this, but their longevity is not very long. Another drill takes advantage of holding a golf, tennis or floor ball or a plastic doughnut in the palm of your hand. They all work to some extent, however, the problem here is that your hand is closed around the object, so it is not really in the same position as it would be when you swim. This causes your hand to have a slightly different angle during the catch phase and also it is easy for your hand and forearm to get fatigued since you have to put conscious effort to hold an object or to close your fist. The movement feels a lot more natural with the Antipaddles and it also let’s your mind focus on the actual catch and not on keeping a tight grip on some object in your hand. Furthermore, if you happen to twist your hand in the wrong way on the entry or during your pull, the boat-like hull shape of the paddles forces your hand in the right position. What are the specifications of the Antipaddles? The material of the Antipaddles is similar to of a regular paddle with the difference that the Antipaddle is hollow and more bulbous. The straps around your middle finger and wrist are made out of the commonly used surgical tubing which is very easy to put on (when wet). Remember, the straps do not have to be tight on your fingers and wrists, just snug enough to keep the paddles from falling. The top of the paddle has contours for your fingers and a small raised ridge which fits into your palm and nicely mimics the way your fingers and palm should be positioned when swimming without paddles. Your fingers slightly apart and your palm relaxed. There is also one extra additional feature which distinguishes the Antipaddles from similar type paddles and it is a small plug for watter in the top of the paddle. Since the paddles are hollow, they can be filled in with water or some other substance which let’s the swimmer play with the buoyancy of the paddles and also let’s you work on strengthening your muscles further. I think the plug for the water needs a bit more thought in regards the usbility and positioning since it is quite tough to take the plug out and then let the water out, but overall it is a great addition. The Antipaddle comes in two different sizes and colors, so the folks with smaller hands are also in luck. How to use the Antipaddles? The beauty is that the paddles can be used for all strokes and anybody can take advantage of them. Since the pressure on your hand, forearm, arm and shoulder is lessened by using the Antipaddles, there is lesser risk of injury to younger and older athletes as there would be with using regular swimming paddles. When you swim with the paddles, you should focus on improving the positioning of your hand in relationship to your body (not too close and not too far) and on the early forearm catch in your stroke. Since swimming is not really one size fits all sport, you need to try different positioning of your hands and find the one that suits you the best. Also remember that your hand is just an extension of your forearm, so your wrist should not move when you swim with the paddles. Stroke rate training - since there is less palm resistance you can move your arms through water faster which is perfect for practicing your desired stroke rate rhythm for long distance or open water swims. Also, you can use the paddles to practice your sprinting stroke with high arm turnover rate. If you are not convinced that the Antipaddle is one of the best swimming gear tools out there, let me assure you that it works. The difference of feeling the water and the lack of it can be experienced by everyone regardless of what swimming level you find yourself in. Actually, the feeling when you take the paddles off is like a drug, you want more:). So if you are serious about improving in your swimming, but you are weary about purchasing any equipment, I’d strongly encourage you to consider getting yourself a pair of the Antipaddles. The best results come from improving your technique and by increasing the feeling for water ever slightly. With these paddles you are doing just that. This goes also to all the triathletes, forget the regular paddles and get the Antipaddles. If I’d have to choose one equipment to have in my bag, this would be it. It is by far the best tool in comparison of effort, price and the improvements. That looks interesting enough, although I'm sure I'd be feeling pretty sore the morning after a session with that little gadget!